LDC’s ADR software enables users to review method accuracy and precision data including field QC and calibra¬tion contained in electronic data deliverables (EDDs) and qualify that data according to project-specific criteria as defined in your Quality Assurance Project Plan (eQAPP). The qualified data can be exported to your database with the qualifier field appended. ADR also has a large variety of reports that summarize data quality outliers, detail the reason for the qualifier(s) and list all samples affected by the qualification. ADR makes an excellent front-end data checker for all environmental databases, allowing for 100% of data to be reviewed prior to uploading to your database. The ADaPT software program was developed on the Microsoft ACCESS platform as a tool to support technical staff in the evaluation of analytical chemistry data using an expedited and cost effective automated process. The electronic data deliverables (EDD) provides a standardized format, allowing laboratories to streamline the data deliverable process. ADaPT processing allows the data end user to efficiently evaluate large data sets for key indicators and ultimately determine the usability of the data. The application is designed to perform compliance screening of the EDD and routine data quality accuracy and precision checks traditionally performed through a manual data review. The EDD is checked for standard value errors, incorrect formatting, and missing information from required fields through the Contract Compliance Screening module (CCS). 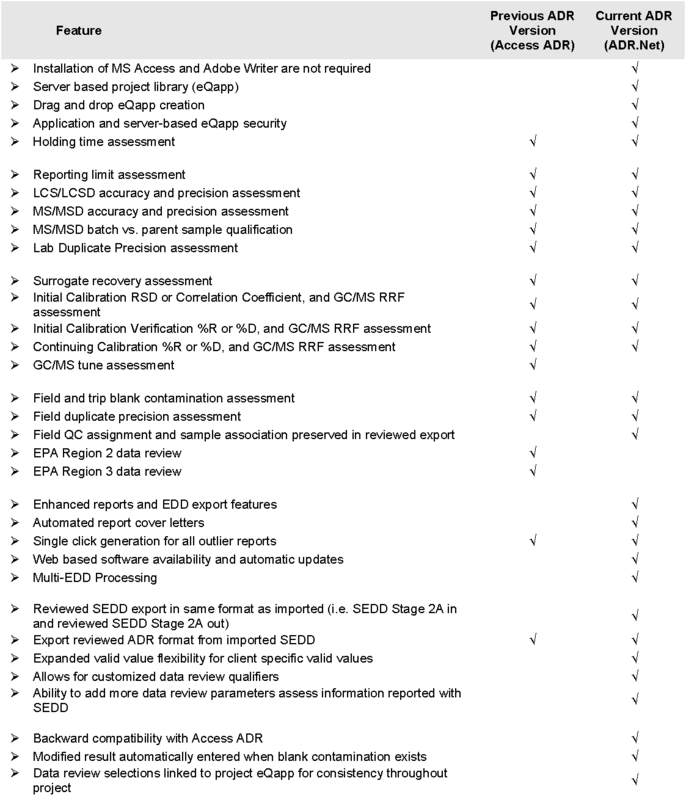 The CCS software verifies the EDD immediately for completeness and compliance against project specific criteria. The Automated Data Review module (ADR) performs an automated data review equivalent to an EPA Level 2 evaluation and provides the user with discrete data qualification. Data qualifiers are appended to each result in the EDD. After ADaPT processing, the qualified data are then ready to be exported into a database.